This unique combination of suran and chana dal along with mint and chaat masala, make these tikkis delicious and a must try. You can avoid garlic if you would prefer a milder, simpler taste. 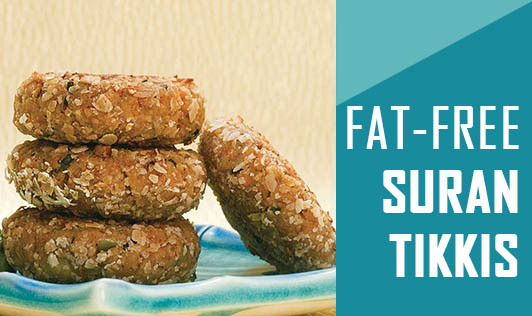 As these tikkis are cooked without any oil, they are also very healthy. Green Chilies, Chopped- 2 nos. • Heat a non-stick pan and dry roast channa until it turns light pink in color. • Cool the channa dal and grind it to make a fine powder, and keep aside. • In the same pan dry roast onions, garlic, ginger, and green chilies until the onions are slightly brown in color. • Add the chopped suran, ½ cup water, cover, and cook on slow flame until the suran turns soft and all the moisture is out. • Mix the channa dal powder, suran mixture, garam masala, salt, and chaat masala together. • Divide the mixture into 6 equal parts and make round tikkis out of it. • Heat the non-stick pan and cook them on both sides, until they turn golden brown. • Serve hot along with mint chutney or ketchup. Note: Always use a non-stick pan for cooking.